I am writing in support of the Rock Island Trail on behalf of Adventure Cycling Association, the largest bicycle nonprofit organization in the U.S. with over 53,000 members. Once complete, the 144-mile Rock Island Trail will be a trail of international significance. The completion of the first 47 miles is an achievement to celebrate, and together, the Katy and Rock Island trails will create a world-class loop that will make Missouri even more of a destination. A study from 2012 reported that the Katy Trail generates $18.5 million for the state and the many communities it serves. The study also found that over 400,000 people visit the trail annually, 85% of whom bicycle the trail, and that number has only grown in the last five years. Additionally, these trails will someday be part of U.S. Bicycle Route 50 (USBR 50), an officially-approved, cross-country bicycle route that will eventually connect San Francisco to Washington, D.C. Currently, over 700 miles of USBR 50 have been completed from DC to the Ohio/Illinois border. And with multiple connection points to Amtrak’s Missouri River Runner route which offers carry-on bicycle service, it will be easier than ever for visitors to travel to the trail with their bikes. Bicycle tourism, and bike travel in particular, is a form of geotourism that supports local communities, businesses, and economies because of its slow pace and the frequent need for services like food and lodging. Bicycle travelers stay longer and spend 40% more than the average motorized tourist. Active tourism is growing in popularity and bicycle recreation accounts for $97 billion in spending in the U.S. each year, according to a new study by the Outdoor Industry Association. The Great Allegheny Passage, a 150-mile off-road trail connecting Maryland and Pennsylvania, generates $80 – 100 million return on investment each year, and 95% of its million visits each year are by bicycle. 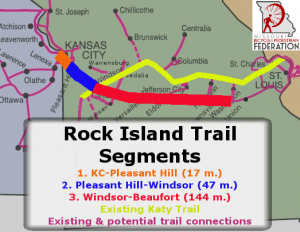 With the development of the Rock Island Trail, Missouri would be tapping into this market and could potentially see a similar return on investment. Thank you for making the right decision and moving forward with developing the 144-mile Rock Island Trail. It will truly be a gem of the Midwest. Adventure Cycling Association inspires and empowers people to travel by bicycle. It is the largest cycling membership organization in North America with more than 53,000 members. Adventure Cycling is the lead organization working to create an officially approved, numbered, and signed bicycle route network called the U.S. Bicycle Route System. It also organizes more than 100 tours and leadership courses annually, and publishes the Adventure Cyclist magazine. With over 46,000 meticulously mapped miles in the Adventure Cycling Route Network, Adventure Cycling gives cyclists the tools and confidence to create their own bike travel adventures. 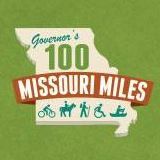 Supporting a world-class bicycle, pedestrian, and trails network across Missouri is one of four major goals of our Vision for Bicycling and Walking in Missouri. Supporting major statewide trails initiatives like the Rock Island Trail is one of the most important things we do to help reach that goal. Your ongoing membership and generous financial support helps turn our Vision into reality. Thank you!